The Pepino Margarita from Padre. Photo by Brian Addison. Fan of listicles? Click here for our archive. Happy hours in this day and age are ubiquitous if not outright banal. True happy hours—the kind where you can genuinely score quality grub and drinks at decent prices—have become entangled with crappy ones. To the chefs and restauranteurs out there, irked that I even mention “crappy happy hours,” fear not; I am not here to encourage you to give away food or discount drinks to the point where business viability is lost. No, no. I know of the complaints toward and exhaustion with making happy hours happen: How dare you mark a dollar off a $10 drink and assume that makes one happy during a particular time of day? What is the point of half-off appetizers when you cut the portion itself in half? WHAT DOES ONE DOLLAR OFF EVEN MEAN? I get the frustration on both sides of the Happy Hour Menu. But here’s the thing, if I may appeal to both consumer and chef alike: Happy hours can very easily draw regular, loyal patrons to both your establishment and dinner menu if you play your cards right. And Long Beach, thankfully, often plays its cards right when it comes to the hours which bring gastronomical and financial happiness. 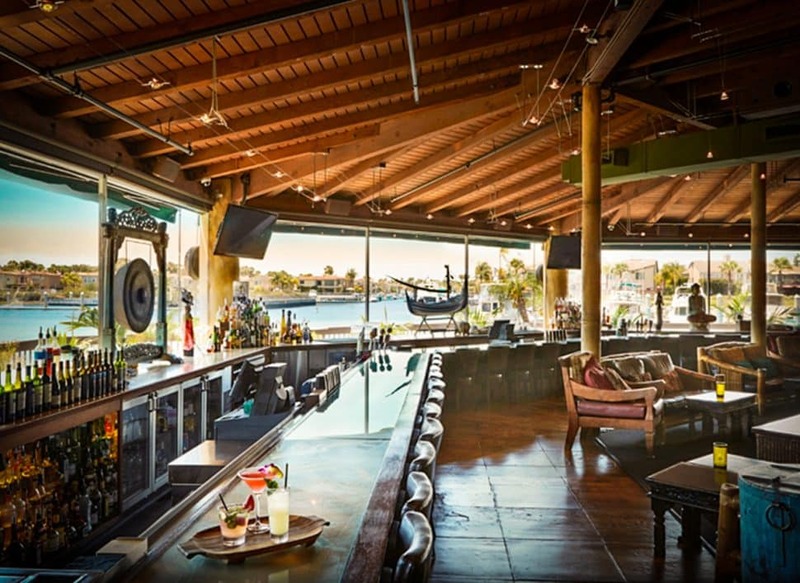 Tantalūm’s interior facing Alamitos Bay in Long Beach. I begin with Tantulūm for reasons that go beyond its happy hour menu—mainly the fact that, ironically nestled between the two corporate giants that are Nordstrom Rack and Acapulco, it offers happy-hour-goers one of the most hidden’n’quiet spaces to kick back, complete with expansive views of the Alamitos harbor and a forgotten island (mansion) hut feel that makes it one of the most unique happy hours you’ll have in the city. I mean, c’mon, look at that picture. And the food is actually quite good. You can score six sliders—including two Kobe beef —for $15 (or just order a whole Kobe burger for $12). Chicken wraps for $8. $10 flat breads. And the best part? 22-ounce pours of craft beer for $7.50. Los Compadres’ chavela drink. Courtesy of Claudia B./Yelp! Some—including myself—would argue that the happy hour at Los Compadres is easily one of the best in Long Beach. Casual, approachable, accessible, and outright delicious. 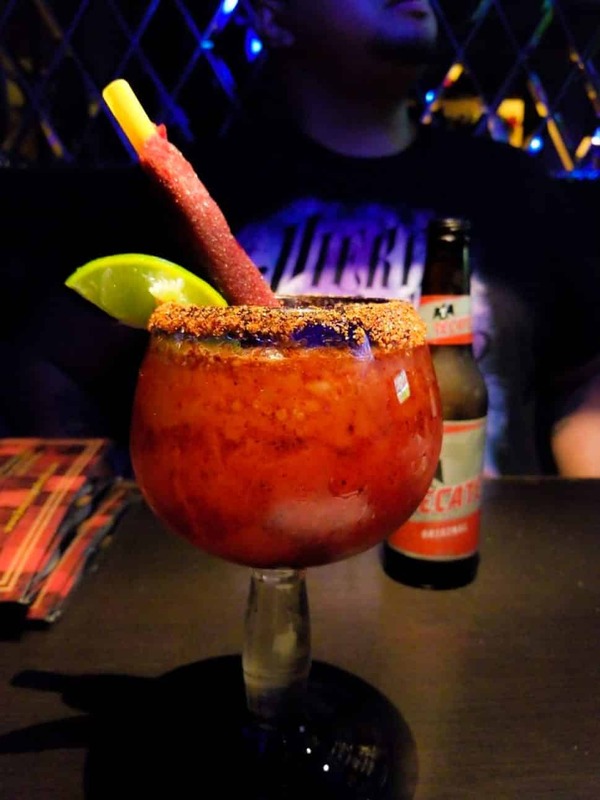 While everything from their spectacular house margaritas to piña coladas to daiquiris and micheladas’n’chavelas—like the masterwork pictures shown here—are only $6 and can easily take you from stressed to DGAF, it is the food portion that is truly the bargain. Everything on the food side of their happy hour is $7. Everything. Queso fundido (chorizo included). Shrimp cocktails. Ceviche. Burritos. Nachos. Their massive quesadillas. Tacos. Sopes. Gorditas. Pier 76’s smoked fish tacos. Photo by Brian Addison. Right across the intersection from L’Opera sits Chef Chris Krajacic’s casual seafood powerhouse—and the success of Pier 76 shouldn’t be underestimated. After moving from cramped quarters at the Cooper Arms Building at Ocean and Linden to its more spacious home at First & Pine, Pier 76 is the place where it is rare to not see it buzzing. Since then, the man has opened locations in Cerritos, Tustin, Riverside, and later this month, El Segundo. 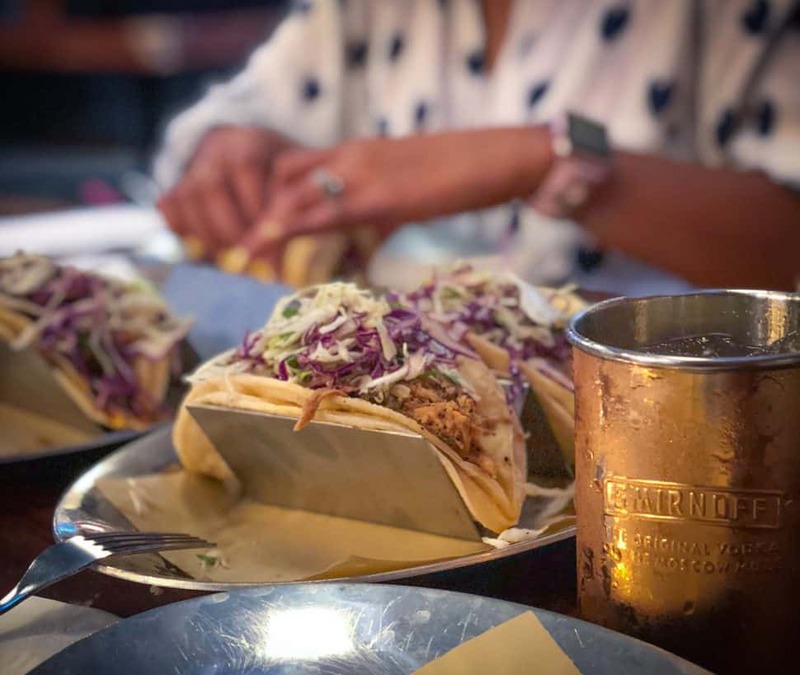 And with that grand introduction, I utter three words to highlight Pier 76’s happy hour: smoked fish tacos—and at $2.76 a pop, they’re an utter steal. Krajacic’s massive folded wonder is up there with the great fish tacos in the city because it is so distinctly Pier’s creation: smoked fish—completely different from my other favorite fish taco, El Cheko’s mighty smoked marlin taco—topped with a generous heap of mango salsa. On top of that, enjoy $4 craft pours, bowls of chowder fries, and über-cheap ceviche. The Harbor’s pulled pork tacos. Photo by Brian Addison. Speaking of Chef Chris Krajacic, he took on a new adventure. It was once Hooters, before it moved to the Pike Outlets. Then it was an off-shoot of Belmont Shore’s La Creperie when it began its own expansion before quickly closing up shop. Then it was La Shish, referred to on the colloquial side as a term for excrement. Then it was Moonshiners, a wannabe craft cocktail joint that offered $125 Hennessy bottle service paired with a champagne room. Now, it is The Harbor. 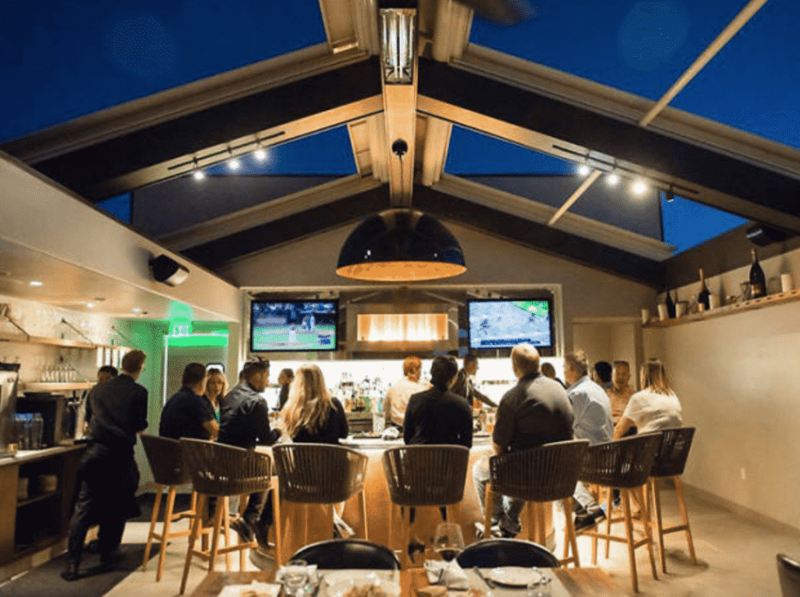 Even more, following the closure of The Sky Room after the purchase of the building by Pacific6 for a bottom-to-top renovation, that meant that Cielo, its rooftop bar, would also close—leaving one of the city’s most talented beverage managers, David Schmidt, free for the market. Or, in this case, free to tackle The Harbor’s extensive cocktail list. Here, you’ll find should-be-$16 cocktails for $8. And on Tuesdays? 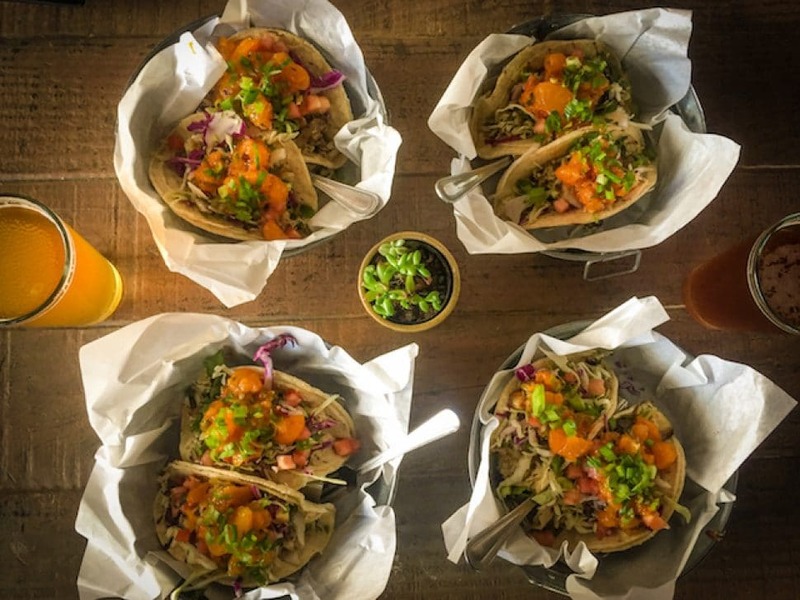 You’ll find distinctly unique taco creations like Krajacic’s fiery tri-tip tacos, stuffed with fries and cabbage, lacquered chicken tacos, and smoked pull pork tacos—and you get two massive tacos for $4. Add to this free skee ball, pool, shuffle board, giant UNO cards… And, well, your hour will be more than just happy. 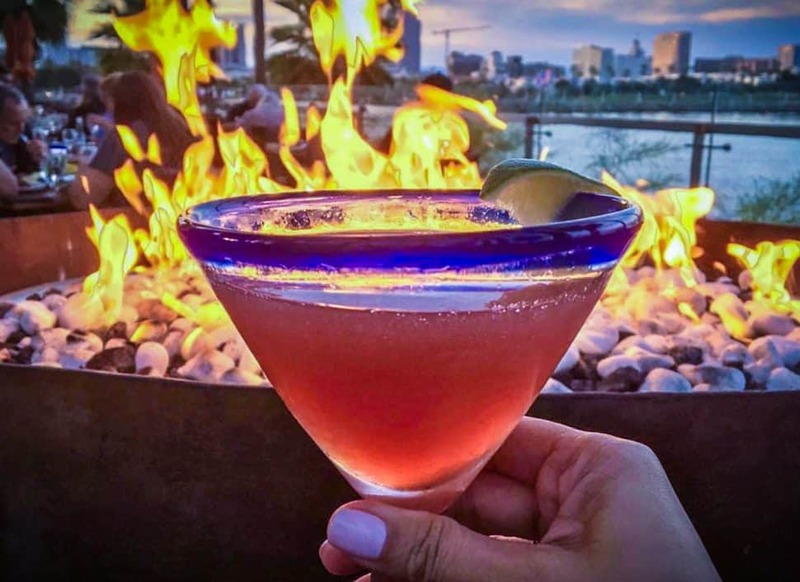 A drink aside Fuego’s fire pit with a view of Downtown Long Beach. Courtesy of @cocoluvshiver/Fuego. Much like its easterly counterpart mentioned above, Tantalūm, Fuego at Hotel Maya—a space that I have called one of the places to escape the city without leaving the city—has unparalleled views of Downtown Long Beach from its north-facing shore. On top that, house margaritas are six bucks during happy hour—and don’t think these margaritas are light pours. 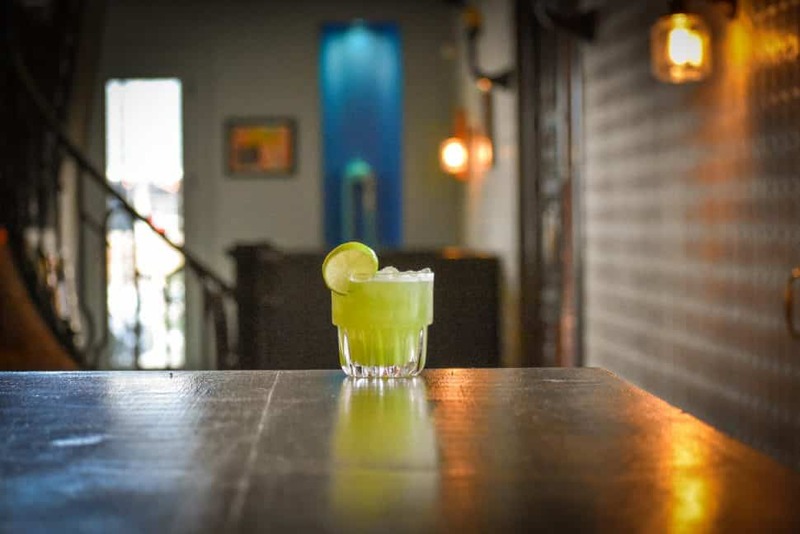 Much like Los Compadres, they’re heavy on the tequila and balanced out with house made sweet’n’sour that parallels some of the best in the city. On top of this, you can meander their mini-beaches (fire pits included) or walk along the shore sidewalk all the way to the Queen Mary. It’s an enchanted happy hour experience if there ever was one. Insider tip: take Long Beach Transit’s free Passport to the area so you don’t have to pay for parking. 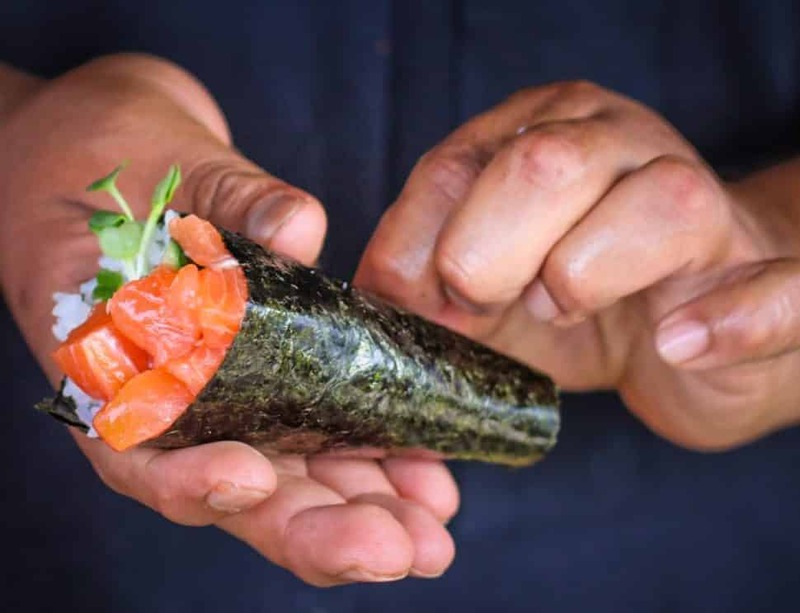 Roe’s Chef Art Gonzalez creates a tuna hand roll. Photo by Brian Addison. I am, admittedly, late on the Roe game. I got a ton of flack for not including it on my best restaurants of 2017 list—Chef Art Gonzalez has not one but two restaurants in the city, this one being his muse so to speak, given it took him well over five years to get off the ground—but in all honesty, I hadn’t been so it would have been difficult for me to ethically put it on such a list. It is now becoming a more common part of my dining out routine—especially for its happy hour. 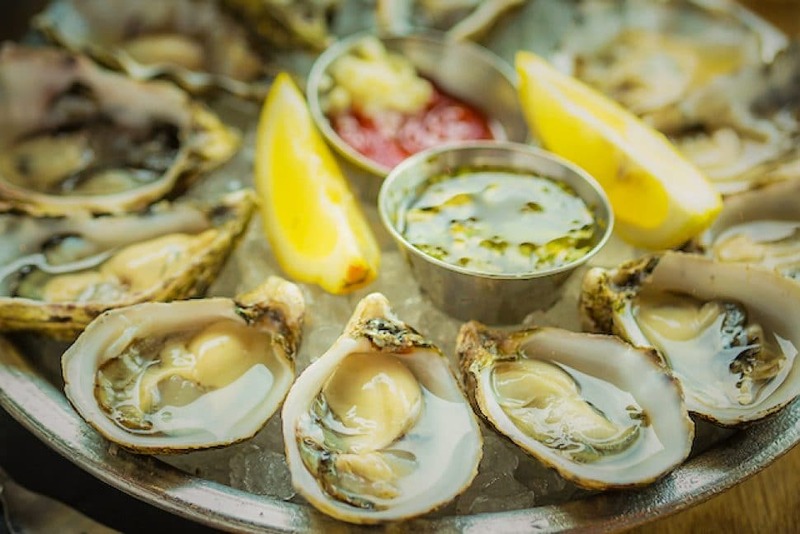 Go for the $2 oysters—some of the best happy hour oysters in the city, if not the best—and the delectable $7 duck fried rice. 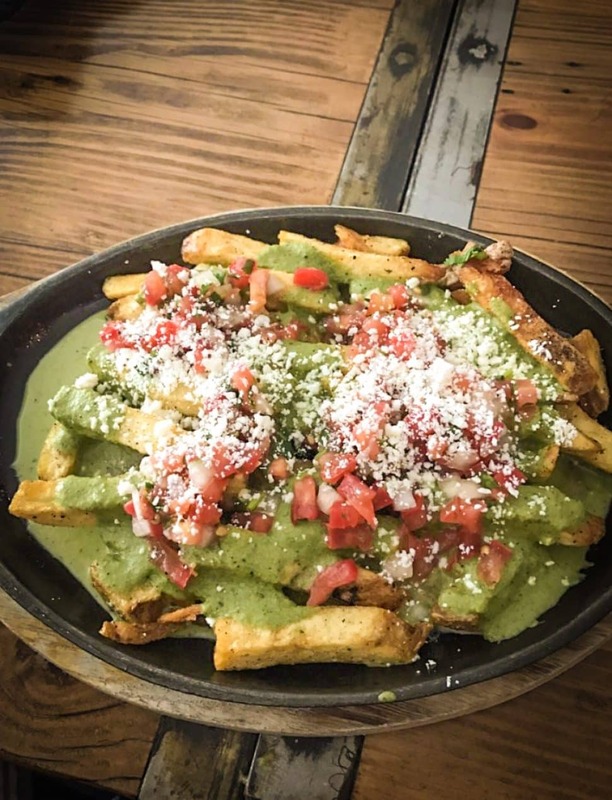 Panxa Cocina’s poblano fries. Courtesy of Jesse C./Yelp! Long Beach, meet New Mexico. I segue into Panxa because it is the aforementioned Chef Gonzalez’s first full-fledged cuisine affair with Long Beach since he returned from Santa Fe (working at McKenna’s doesn’t count), where his love of the Hatch chile and southwestern grub—almost entirely devoid in the LA food scene—is so beautifully explored in the linked piece by my friend and comrade Sarah Bennett. When Padre brought on Guadalajara-based Chef Manuel Bañuelos—the guy who once served up the area’s best torta ahogada at Balam in Lynwood (which is still open and still good—the menu was flooded with creations like tacos filled with mole alemandrado and witty twists like chicken tinga masala. This plays into their happy hour. Not only will you score $25 pitcher of prime margaritas—from their tamarind mandarin concoction to the cucumber Pepino margarita—you’ll find an assortment of perfect-while-drinking apps on the cheap. Like Bañuelos’ al pastor chicken wings, which are dangerously addictive. Or his yucca fries, large pillars of the root veggie tossed in spices with a dipping sauce. And, of course, Takis-encrusted elote. Beer Belly’s Al Pastor Meatballs. Photo by Brian Addison. Chef Wes Lieberher isn’t lighthearted when it comes to two things: his food and his beer. Which is why Beer Belly’s “Hoppy” Hour is a steal for both stomachs and palates alike. Sure, you have a full-fledged burger for $8 and a generous portion of wings for $6 but if you really wanna get down on Lieberher’s style, go for the $6 Al Pastor meatballs [pictured]. There’s a reason it’s one of the city’s best restaurants. But perhaps Beer Belly’s hidden gem is bartender Sherwood Souzankari, whose talent for blending flavors is more reflective of the entire LA scene than it is Long Beach specific: sometimes challenging, oftentimes rewarding. So if you’re here for Hoppy Hour, my suggestion in the way of libations is to always go for the $8 Dealer’s Choice Cocktail—I assure you Sher won’t let you down. 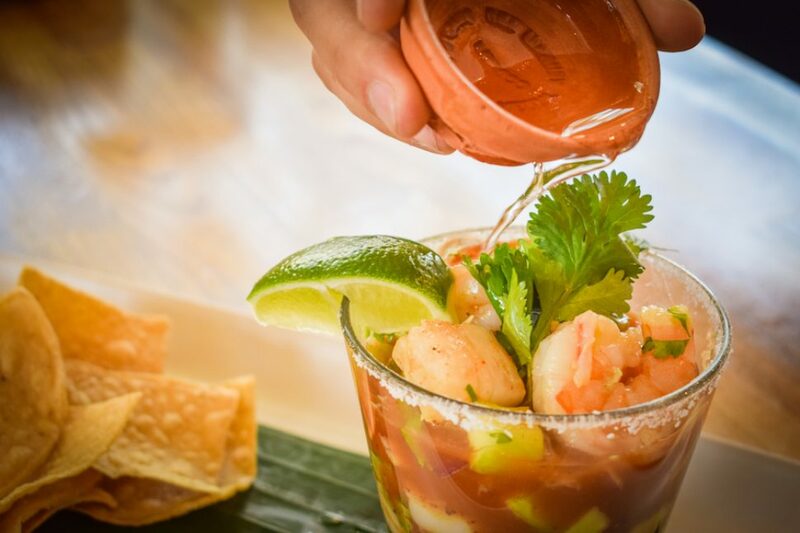 A shot of mezcal poured over Lola’s shrimp cocktail. Photo by Brian Addison. There’s something special about a place when, eschewing the discount of existing items, it dedicates a whole menu to the almighty Happy Hour. Its entourage of happy hour grub is $6. Wondering what you can get? There’s really no need to describe but rather just list: handmade sopes trio, tinga tostaditas, Mexican pizza, queso fundido, mole chicken nachos, Mexican elote, guacamole, taquitos, a good ol’ quesadilla, and Lola’s cuetes [pictured]. On that last one, do not mess around: named after the almighty firework, Lola’s cuetes are bacon-wrapped stuffed jalapeños—which are dangerously addictive. Need another suggestion? The sopes trio is a steal and includes one with Lola’s excellent birria as well as another with carnitas and chicken tinga. 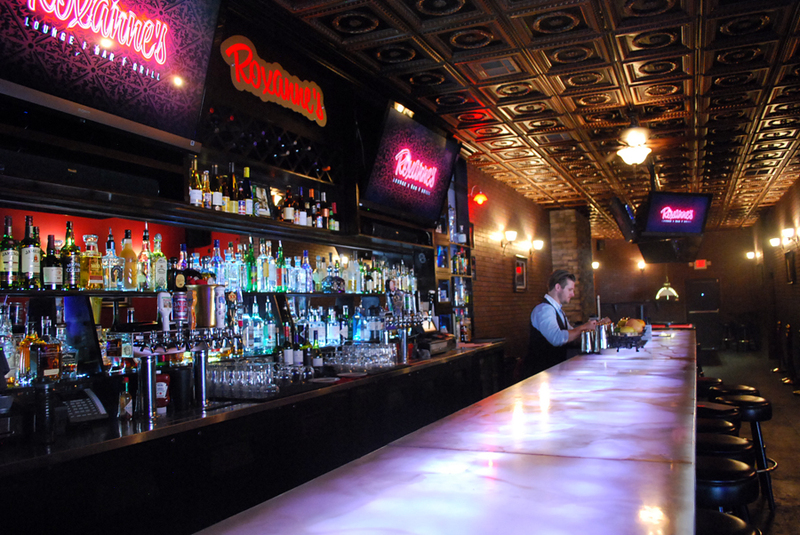 And don’t forget the $4 Modelo pours, $5 margs or palomas or mules, and $8 craft cocktails (get the La Dama). 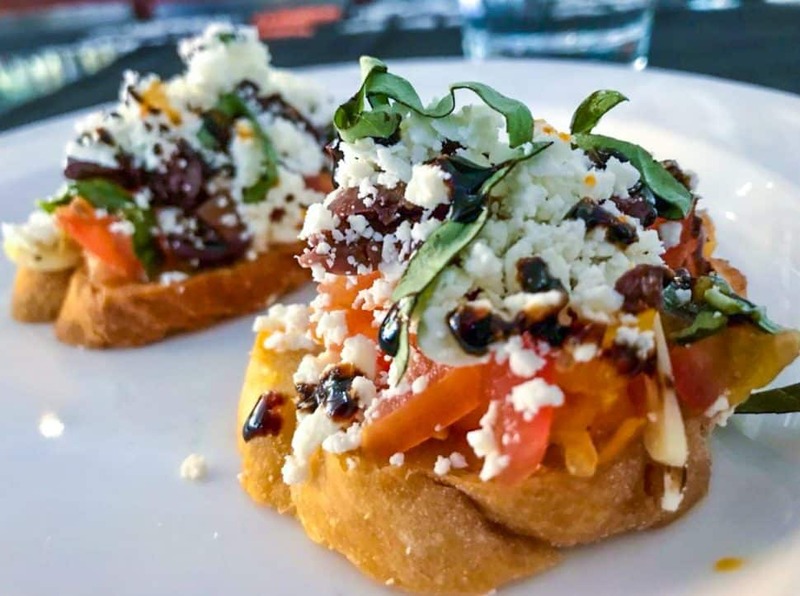 L’Opera’s feta bruschetta. Courtesy of Dino D./Yelp! L’Opera is, by many definitions, a Long Beach staple, having introduced the city to fine dining a la Italy since 1990. And yes, this white cloth-and-crystal establishment has a stellar happy hour that introduces folks to their food—and those folks may very well be those that otherwise can’t afford its regular menu. I am talking $9 platters of their menu’s staples, from pastas to meats. My suggestions? One should unquestionably go for two dishes if it’s your first time experiencing L’Opera. Start with their carpaccio—maybe my favorite antipasti dish in general—composed of ultra-thin layers of raw beef tenderloin, drizzled with olive oil and topped with capers, baby arugula, and shaved parmesan. After that, go for their housemade pasta—and I suggest, without question, their cappellacci di zucca [pictured], a signature L’Opera offering of pasta filled with a creamy blend of butternut squash and ricotta, placed over a generous puddle of spicy marinara, and topped with shaved parmesan, fried sage, and finished off with a drizzle of a brown butter sage sauce. It’s impeccable. And don’t forget the $3 glass of vino. Big Catch’s plate of oysters. Photo by Brian Addison. The Big Catch has always been a bit underrated for me, always overshadowed by the (much farther, much pricier) Boiling Crab. Well, I have four words for you, Garden Grove: all day happy hour. And I have three more: two-dollar Sapporos. They have a lot more. $2 Cajun fries. $6 fried seafood platters. And then meta-happy hours, happy hours within happy hours: afternoon happy hours everyday from 3 to 7 p.m. that give you $18 crab claws, shrimp, and oysters in one giant cocktail platter and late night happy hours (M-Th, 9 to 11 p.m.; Fri and Sat, 10 to 11 p.m.). 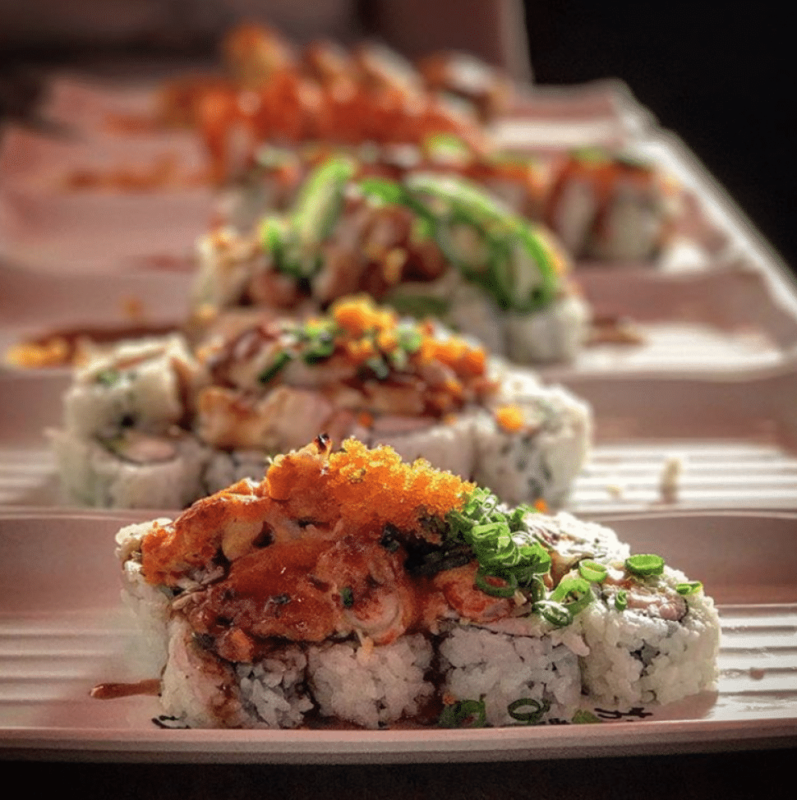 Maru Maki’s array of sushi rolls. Photo by Brian Addison. While I am certainly not saying our city is ready for a Sushi Ginza Onodera or n/naka—we are not—I am pretty confident we can something along the quality of Sushi Gen (whose $32 sashimi lunch platter is one of the best plates at that price you’ll get anywhere). So Maru Maki, in every sense of the word, is a deal. Also, definitely get their pepper jack cheese tempura sticks. They’re just delicious. Roxanne’s in Cal Heights. Photo by Sarah Bennett. Admittedly, my photo is a bit deceptive. Don’t think you’ll be getting one of Roxanne’s stellar tiki drinks—easily the best in the city, if not the region—for some super cheap price. 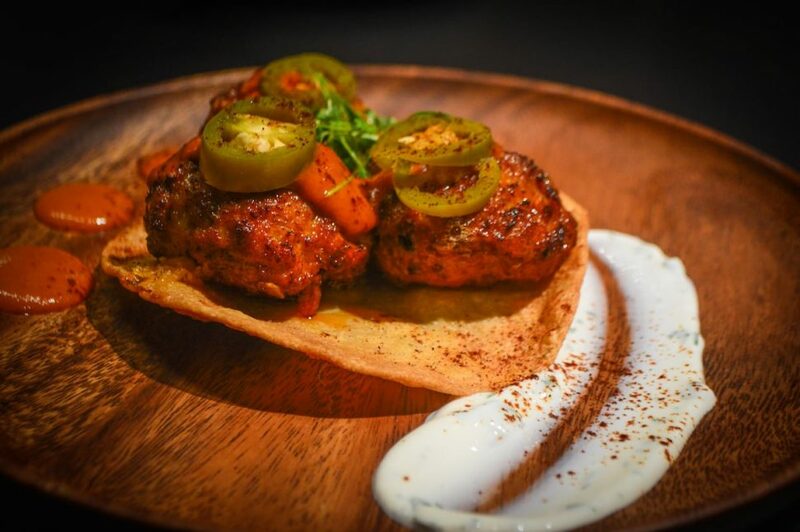 But you will be able to order them with owner Robert Molina’s distinctly Latin American inspired grub, where his Salvadoran roots come out in appetizers that are on the cheap during happy hour. I’m talking empanadas—easily some of the best north of PCH—and gouda nachos. I’m talkin’ $1.50 wings (go with the tamarind BBQ—you won’t regret it). And yes, I am talkin’ a pastrami quesadilla that comes with pickles. Michael’s on Naples’ rooftop bar area. Courtesy of MRG. I’ve touted Michael’s a lot. They’ve sat on my inaugural Best Restaurants list and the Dene empire—whether you want to admit it or not—altered the food scene in here in Long Beach. As fine dining, even in Naples, begins to take a giant step back, Michael’s has done so with it. More uncommon are the $60 plates and more welcoming are the happy hours. And here, they happen seven days a week. From live music on Thursdays to Meatball Mondays, discounted vino and some of the best cocktails outside the masterful concoctions made at Mezcalero and Roxanne’s and the sister joint Chianina, Michael’s on Naples—with its heated, roof-retracting rooftop—is a happy hour experience that is both luxurious and comfortable.